In 1796, a future king of France lived on the second floor. Exiled from his country, he earned his living by teaching French to many of Boston’s fashionable young ladies. Later Louis Phillippe returned home to serve as King from 1830 to 1848. 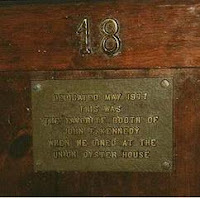 We have visited the Union Oyster House many time when we lived in Pa. Now we live in Fl.,can’t visit quite as often. We are coming to Boston in June to visit you. I found your recept for clam chowder on the Food Network web sit. I made it today. It is exactly the same as I had in your House 6 years ago. I also enjoyed you Oyster Stew, even more than the Clam Chowder. I am a oyster guy. Your clam chowder receipt is thich and creamy like the oyster stew I had at the House. Could you email the receipt for your Oyster Stew?? We will be seeing you in the second week in June. Comming to Boston to raid Fannel Hall and the Union Oyster House.